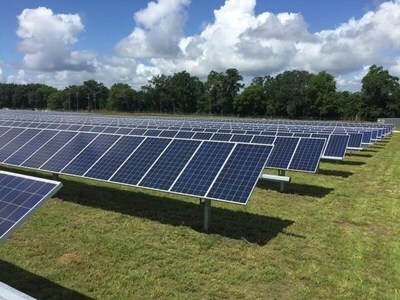 JAKIN, Ga., June 12, 2018 /PRNewswire/ -- United Renewable Energy LLC (URE) and Constellation, an Exelon Company, announced today the completion of a 1.8-megawatt (DC) solar generation project located at Hunter Farms, a 360-acre, family-owned cattle farm in Jakin, Georgia. The Hunter family, which established its company in 1937, will benefit from lease payments from a tracking solar array ? situated within marginal and over-used land. The system ? comprised of 5,305 photovoltaic panels ? operate under a 30-year Power Purchase Agreement (PPA), with Constellation selling all energy and environmental attributes to Georgia Power. It is part of the nationally recognized Georgia Power Company Advanced Solar Initiative, which has helped to make Georgia a top 10 solar state. Constellation now owns and operates 17.8 MW of solar projects in Georgia. United Renewable Energy is an engineering, procurement, and construction (EPC) firm developing industrial and utility solar photovoltaic farms and energy storage systems. UREtm focuses on creative design and implementation to deliver solar and energy storage projects with superior quality, performance, and safety at competitive cost. Learn more at www.u-renew.com.